The Barbour Gorleston Trousers are perfect for this season, crafted from a midweight cotton twill and elastane to give that little extra stretch. These fashionable skinny fit trousers feature the signature Barbour Beacon emblem, nautical striped pocket inners and a contrast tape trimmed inner waist band. 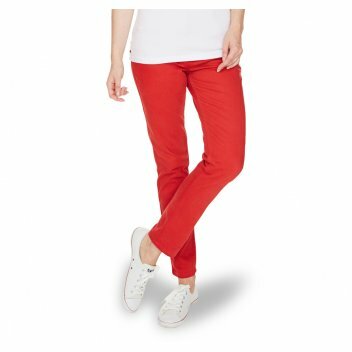 We think these maritime inspired trousers look great come rain or shine. Available in two colours, White and Chilli Red. Inside leg: 74.5cm / 29.5"
Barbour beacon tape, branded trims.